Erie boasts a state park, casino, and racetrack all with the name Presque Isle. Start off your visit on the 1st (Mon): admire all the interesting features of UPMC Park. For traveler tips, photos, reviews, and other tourist information, read Erie trip planner . Washington DC to Erie is an approximately 5.5-hour combination of flight and bus. You can also do a combination of train, flight, and bus; or drive. Prepare for slightly colder weather when traveling from Washington DC in April: high temperatures in Erie hover around 56°F and lows are around 37°F. Finish up your sightseeing early on the 2nd (Tue) so you can travel to Crestview. Crestview is a city in Okaloosa County, Florida, United States. Kick off your visit on the 3rd (Wed): tour the pleasant surroundings at Emerald Coast Zoo and then kick back and relax at Santa Rosa Beach. On the next day, look for gifts at Salt Water Cottage and then buy something for everyone on your list at Grand Boulevard at Sandestin. To see where to stay, ratings, photos, and more tourist information, read Crestview trip itinerary planning app . The Route module can help you plan travel from Erie to Crestview. The time zone difference moving from Eastern Standard Time (EST) to Central Standard Time (CST) is minus 1 hour. When traveling from Erie in April, plan for much warmer days and a bit warmer nights in Crestview: temperatures range from 79°F by day to 54°F at night. Finish your sightseeing early on the 4th (Thu) so you can travel to Titusville. America's "Space City," Titusville sits on the Indian River, just west of Kennedy Space Center, the origin point of every NASA human space flight since 1968. Start off your visit on the 5th (Fri): look for gifts at Ron Jon Surf Shop and then see the sky in a new way at NASA Kennedy Space Center Visitor Complex. Here are some ideas for day two: see the interesting displays at Ponce de Leon Inlet Lighthouse & Museum and then identify plant and animal life at Canaveral National Seashore. Discover how to plan a Titusville trip in just a few steps with Inspirock's itinerary builder. Traveling by car from Crestview to Titusville takes 6.5 hours. Alternatively, you can fly. The time zone difference when traveling from Crestview to Titusville is 1 hour. Traveling from Crestview in April, expect a bit warmer with lows of 64°F in Titusville. Wrap up your sightseeing on the 6th (Sat) to allow time to drive to Islamorada. Take a break from the city and head to Florida Keys Wild Bird Rehabilitation Center and Spray Watersports. Give yourself a bit of retail therapy at Bella Sol Fragrance Bar and Gifts and Michelle Nicole Lowe Art Gallery. There's much more to do: take a tour by water with Robbie's of Islamorada, enjoy the sand and surf at Anne's Beach, appreciate the extensive heritage of Indian Key State Historic Site, and indulge your thirst for a good beer at Islamorada Beer Company Brewery and Tasting Room. To find where to stay, traveler tips, and other tourist information, read Islamorada online trip itinerary builder . Traveling by car from Titusville to Islamorada takes 5.5 hours. Alternatively, you can do a combination of bus, shuttle, and flight; or do a combination of bus, shuttle, and flight. Plan for a bit warmer nights when traveling from Titusville in April since evenings lows in Islamorada dip to 75°F. Wrap up your sightseeing on the 9th (Tue) to allow time to drive to Marathon. Start off your visit on the 10th (Wed): stop by Bayshore Clothing, look for all kinds of wild species at Crane Point Museum & Nature Center, and then immerse yourself in nature at Bahia Honda State Park. Here are some ideas for day two: identify plant and animal life at Dolphin Research Center, then take in the architecture and atmosphere at San Pablo Catholic Church, and then look for all kinds of wild species at The Turtle Hospital. To see reviews, other places to visit, traveler tips, and tourist information, read our Marathon online trip maker . Getting from Islamorada to Marathon by car takes about an hour. Other options: take a bus. April in Marathon sees daily highs of 86°F and lows of 75°F at night. Finish your sightseeing early on the 11th (Thu) to allow enough time to take a bus to Key West. Get outdoors at Fort Zachary Taylor and Dolphin & Whale Watching. Head to Uva Wine Shop & Bar and Sunset Celebrationfor plenty of shopping. 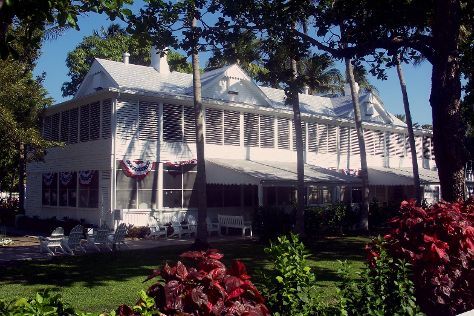 Next up on the itinerary: look for all kinds of wild species at Key West Butterfly & Nature Conservatory, take in the architecture and atmosphere at St. Paul's Episcopal Church, stroll the grounds of Key West Cemetery, and see the interesting displays at The Ernest Hemingway Home and Museum. To see where to stay, reviews, maps, and more tourist information, refer to the Key West online trip itinerary maker . Traveling by bus from Marathon to Key West takes 1.5 hours. Alternatively, you can drive. Expect a daytime high around 83°F in April, and nighttime lows around 74°F. Wrap up your sightseeing on the 15th (Mon) early enough to travel back home.